Shane Watson should start to open the batting for New South Wales if he is to continue as a Test opener, according to the former Australia captain Mark Taylor. Australia's two Test openers, Watson and Simon Katich, are both New South Wales players this season but the problem is that state has a surfeit of openers. At the SCG on Tuesday, Phillip Hughes and Phil Jaques walked out first, as they both aim to show the national selectors they should be considered for Test duties. Katich batted at No. 3 and Watson was being rested, but Taylor insisted that if he was playing Watson should bump Hughes or Jaques down the order. "One thing I'd like to see with Shane Watson, if you're going to be a long-term opening batsman, is to take up opening the batting full-time," Taylor told AAP. "That's going to be an interesting discussion with people like Simon Katich and Phil Hughes and Phil Jaques at New South Wales. I know what I'd say if I was in their shoes." 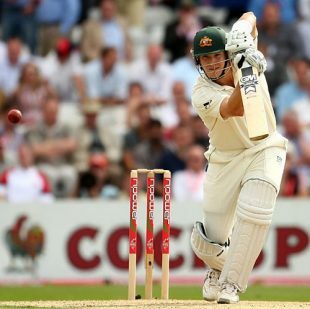 Watson took over the Test opening job when Hughes was dropped during the Ashes and performed admirably, averaging 48 in his five innings. It was a major improvement on the extended opportunity he had to open for Queensland in the first-class competition in 2007-08, when he scored four ducks from six innings. However, Watson's value as an allrounder is likely to decrease if he continues to open in Tests. During the three Tests in which he opened in England, he sent down an aggregate of eight overs. "It seems to me Shane Watson was introduced into the side as an all-rounder, as an extra bowling option as well as a batting option," Taylor said. "That's going to be hard if he decides to open the batting." Taylor also believes it will be difficult for Brett Lee to fight his way back into the Test side following the news that the bone spur on his right elbow may require surgery and a three-month lay-off. Taylor said Lee would not have the option of extending his career by reducing his pace, in the manner of Dennis Lillee or Glenn McGrath. "If you look at Lillee and McGrath, they started out trying to be tearaway quicks but by the end of their career they weren't terrifying, mad fast bowlers, they were just very good fast-medium bowlers," Taylor said. "That's where I think Brett's going to struggle because he's not the sort of guy you can say, 'let's drop back to 135kph and bowl line and length'. That's never been his forte." Taylor cited Jason Gillespie as an example of a fast bowler whose impact diminished significantly when his pace dropped, as was exploited by England in the 2005 Ashes. Gillespie himself said Lee might have to consider retiring from Tests and focusing instead on the shorter formats. "He may just decide to travel the world on the Twenty20 and one-day circuit," Gillespie said in the Australian. "Part of him might think that's quite appealing. There's not as much stress on the body. It's a difficult decision. He loves playing Test cricket, but everyone has to do it [retire] at some stage."